1. Heat stock in saucepan until simmering. 2. Meanwhile, heat oil in a saucepan on medium. Cook leek & garlic for 5 minutes, stirring, until soft. Stir in rice and cook for 1 minute until rice is translucent. Add ½ cup of stock, stirring until absorbed. Repeat with remaining stock, ½ a cup at a time, stirring, for 15-20 minutes, until stock is absorbed. 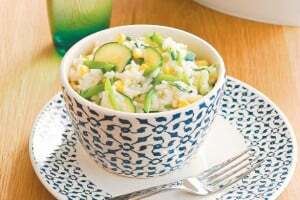 Fold through peas, beans & zucchini and cook for another 5 minutes until rice is tender & creamy. 3. Remove from heat and stir through parsley and parmesan. Stand covered for 5 minutes. Season to taste and serve with baby rocket (or similar).